Lippert Components, the company responsible for many trailer frames (including the one on our fifth wheel trailer) and the manufacturer of lots of other essential RV gear — from doors to windows to axles — is putting together a new RVing publication called RV Open Road. Their blog has been up for a while, and it offers lots of tips and tricks for RVers. RV Open Road will soon be published in a print magazine edition as well, and it will be available for free at RV dealerships and supply stores across the country. 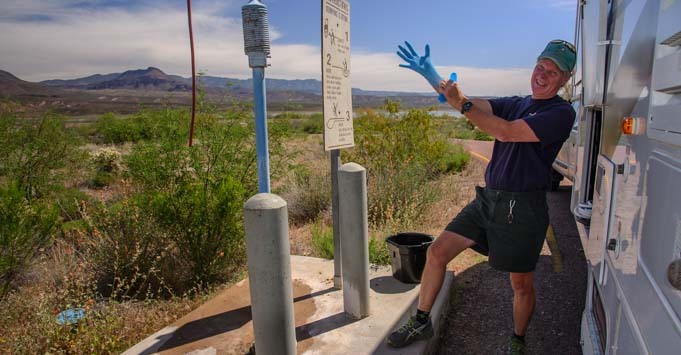 Some RV dump stations are quite scenic — but Mark still makes a face when he puts on those rubber gloves! The online world is an amazing place, and we got hooked up with Lippert Components almost a year ago on Google+. Ironically, this is the third RV Dump Tips article we’ve written (the first two were for Trailer Life and Motorhome Magazine), and we’ve also got our own RV Dump Tips page on this site. I’m not sure we’re specialists on that topic (yikes, what kind of credential would that be? ), and I’m a little afraid of developing a reputation (I was quite taken aback when a friend of mine referred to them as my “potty articles”), but it is an important part of RVing that we just can’t ignore. Happy reading, and congrats to Lippert Components for their new offerings to the RV community. Emily, your articles and pictures are always fantastic, and informative. This latest article about weighing your RV is VERY timely, as my proscrastination temp has been extremely high on weighing our Conestoga Wagon and Mules due to the hassle of truck stops. Okay, 5ver and truck – no difference except for a passage of time! Since we live in the north part of the Valley of the Sun, and North Ranch is a hop and breakfast away, we’ll check off 2 important issues – joining the SKP’s, and getting our rigs weighed – the right way! Looking forward to your article about the hydraulic brake overlay, you and Mark had done in Texas. I’m delighted my various posts and articles have been helpful to you, Glen. Thanks for letting me know! I hope you find the Conestoga Wagon and Mules are very light on their feet, and I hope you enjoy being part of the Escapees family!!! After reading this I can say that proper waste management services apply to both rural and urban areas. Because of the risk and impact of accumulated waste and toxins, it has also become essential to educate people about proper waste disposal. Thank you so much for sharing this information..